Egypt has issued one or two. 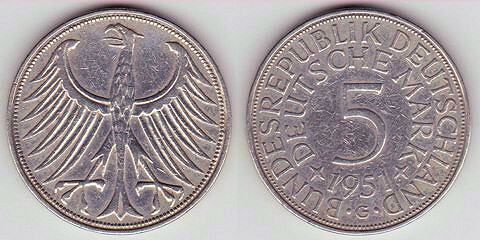 Here is one: 1 piastre, 1984. There are some sphinx designs from the 1950s that look textless, but if you look very closely, you will see two initials. Malaysia's two series of circulation coins have had one side without text or numerals. It is due to issue a new series of circulation designs in early 2012. Will it keep that tradition, I wonder? Germany (Fed. Rep.) 5 DM (early 1950s until mid-1970s). 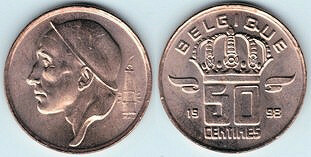 Now you probably don't know this, but there is a very good reason for issuing such coins as these. They are only issued in countries where half the population is illiterate: each side caters for one half of the population. Fair and logical. My next topic will be about coins with only one side. This is more difficult than I thought. I was sure the obverse of the Trinidad 1960s issues was bare of text, but you can see a motto on the coat of arms. Anyway, I still think I deserve HALF a point. Since it is internal to the design, and the text doesn't pertain to the coin, I think it qualifies. German New Guinea, but alas, on paper rather than in the metal. Beautiful! I'd forgotten about that one.